Hazelnut Macaron Cake for My 30th Birthday! 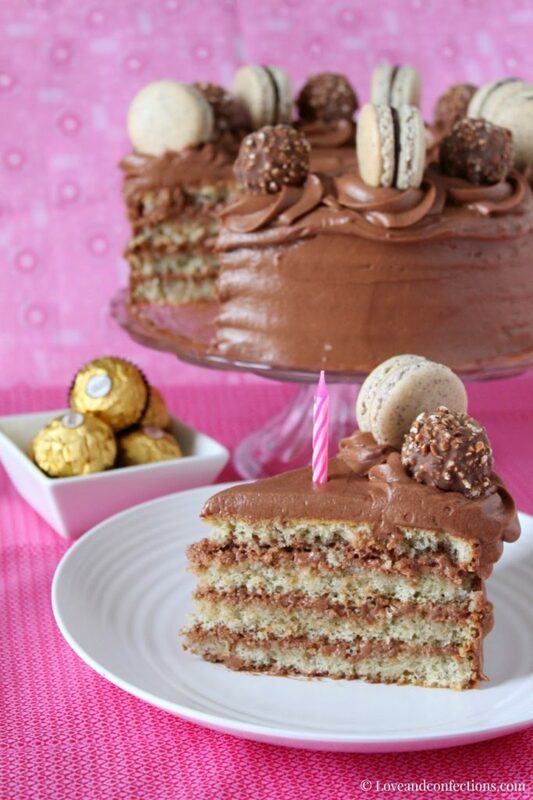 What better way to celebrate a birthday than with family, friends, and this decadent and delicious Hazelnut Cake with Hazelnut Macarons! 30 is a big deal. I honestly can’t believe I am now 30. So much has happened in the last decade – graduated with my bachelors and a culinary degree, got engaged, married and gave birth to our gorgeous baby girl. I am so lucky for everything I have and can’t wait to see what the future brings. My Mom usually made my birthday cake every year. One of my most memorable birthday cakes was a marble cake with chocolate frosting and my younger sister decorated it with every kind of sprinkle imaginable. Recently, since I don’t live in even the same state as my Mom, I haven’t had cake for my birthdays. Sometimes it’s Dirt Cake (pudding), Doughnuts, or Ice Cream. This year I knew I wanted cake. 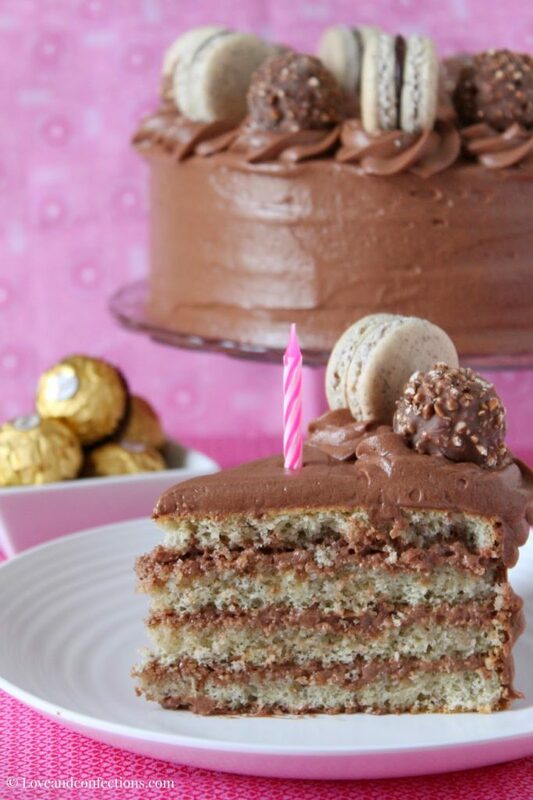 I got the inspiration for this cake from stuffing my face with eating Nutella. Good Lord, you can hand me a spoon and a jar of that stuff and I will be a happy girl. I have loved hazelnut since I can remember. Hazelnut and chocolate are a match made in Heaven, so those were the flavors I wanted for my birthday cake this year. I was also thinking about making something fancy or with a little flair – light bulb – macarons. Those little dainty bites are full of flavor and scream sophistication. If you don’t like hazelnut, sorry, but this recipe is chock full of it. 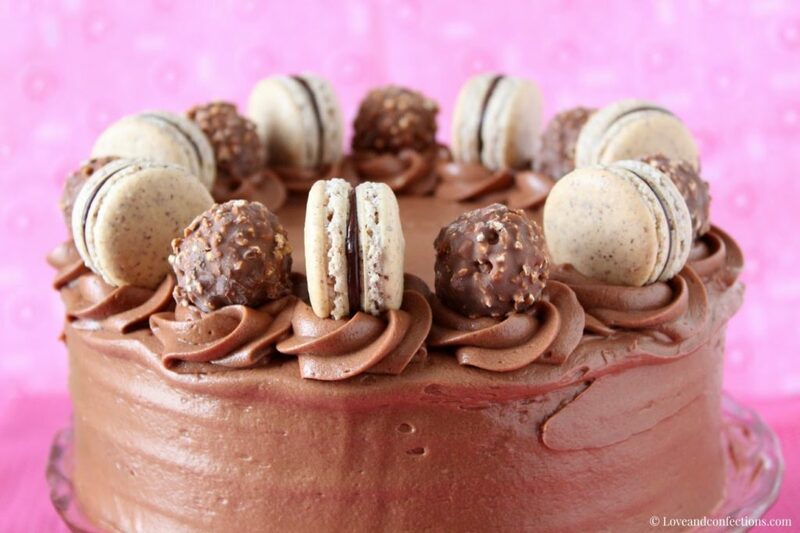 Hazelnut Genoise Cake, Hazelnut Simple Syrup, Hazelnut Chocolate Frosting, Hazelnut Macarons, Hazelnut Ganache and Hazelnut Chocolate Candies… yeah, that’s a lot of hazelnut. Trust me, this cake might seem hard, but anyone can make it as long as you can read directions. I made it in a 2 day time span during nap times – which is a feat in and of itself because Baby L&C has been on a 1-a-day nap streak. 1. Sift Hazelnut Flour and Powdered Sugar twice. If necessary, grind any solids in a food processor or coffee grinder, leaving a maximum of 2 tablespoons not passable through the sieve. Set aside. 2. In the bowl of a stand mixer, or in a mixing bowl with a hand blender, whisk the Egg Whites and Granulated Sugar by hand until combined. With either the stand mixer whip or the hand blender beaters, whip the egg white mixture, increasing speed every 2 minutes (i.e. speed 2, 4, 6, 8, 10) until it has stiff, glossy peaks when you life the whip out of the bowl. 3. Add in the sifted Hazelnut Flour and Powdered Sugar and fold to combine. You do not want to deflate the egg whites completely, so be careful when folding. It should flow like lava and when lifting the spatula and a drop falls off, should be “re-absorbed” into the mix in roughly 3 seconds. I count my folds and usually do anywhere from 45-65, depending on how the batter is. 4. Line baking sheets with either parchment or silicone mats. Prepare a pastry bag with a medium-sized round tip, and fill with the macaron mixture. Pipe into 1/2 to 3/4 inch rounds, 1/2 in apart, being careful not to leave any tips on the macaron – it should fall back into itself if you folded it enough. 5. Tap the sheet trays on a counter, rotating so every edge gets tapped, to insure that there are no extra air bubbles. 6. Heat the oven to 350°F. Let the batter rest for 20-30 minutes, or until the top is firm to the touch. Bake one tray at a time, for 12-13 minutes. Once cool, remove them from the sheet tray and either fill or store, wrapped in a container and plastic wrap, in the freezer for up to a month. 1. Place Chocolate Chips in a small to medium bowl. In a small saucepan, heat the Heavy Cream and Nutella until it just starts to bubble around the edge, whisking a few times to make sure the Nutella gets incorporated. 2. Pour the cream mixture over the chocolate chips and let it sit for about a minute so they get warmed and melt. Whisk the mixture, make sure there are no lumps and that all the chips have melted. 3. Add in the Frangelico and whisk together. Let it firm up in the refrigerator for about 20 minutes. Reserve 330 grams for the Frosting. 4. With a piping bag fitted with a small, round tip, pipe a small amount onto half of the macaron halves, and sandwich them together. Let the macarons sit in the refrigerator until ready to use. 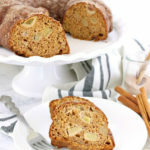 This cake can be made a day in advance and wrapped for freshness. 1. Heat oven to 350°F. 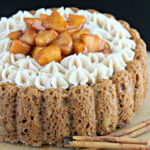 Prepare 2-8″ cake pans with baking spray. Sift the Cake Flour and Hazelnut Flour together and set aside. 2. Crack the Eggs into a medium/large metal bowl and create a double boiler on the stove, insuring that the water in the pot does not touch the bottom of the metal bowl. 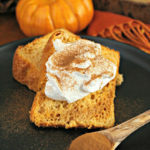 Whisk the Granulated Sugar and Whole Eggs together until frothy, warm, and the sugar has completely dissolved. Using a sieve, strain it into the bowl of your stand mixer. 3. With the whip attachment, whip the eggs until 2-3 times their volume. One trick I learned from culinary school and use is to wrap the bowl opening with aluminum foil to keep the warm air in. Warm eggs whip better. 4. In 3-4 batches, slowly add the flours into the whipped eggs, gently folding and making sure it is mixed thoroughly while not deflating the batter. Make sure the flour does not sink to the bottom. Scrape the bottom if necessary. 5. Evenly distribute the batter into the two cake pans and bake for 20-25 minutes, or until the cake is set and the center springs back to the touch. Cool for about 15 minutes in the pan, then turn out onto a wire rack to cool completely. 1. In a small saucepan, heat the Water and Sugar until the sugar has dissolved completely. Once off the heat, stir in the Frangelico. 1. Place all ingredients, in the order listed, in the bowl of your stand mixer, fitted with the paddle attachment. Beat until smooth and combined. The frosting will be very soft. Refrigerate for about half an hour until it is spreadable. 1. Slice the two Hazelnut Genoise cakes each in half with a long serrated bread knife. 2. Place a spoonful of frosting on a cake round, and spread it with an offset spatula, so the cakes do not move around while frosting. 3. With the cut side up on each of the cakes, brush the Hazelnut Simple Syrup on with a pastry brush. Genoise cakes are a bit drier than others so the syrup really helps to moisten it. 4. Place one of the cakes on the cake round, cut side up. 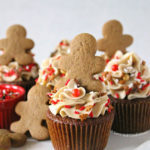 With an offset spatula, spread a few dollops of the frosting for the filling. Repeat with two more layers, making sure the cut side is up. For the last layer, place the cut side down, so you have a smooth top to frost. Refrigerate the cake for about 15-20 minutes, as well as the bowl of frosting, so it sets up a bit. 5. With an offset spatula, frost the entire cake with a thin layer of frosting, called a crumb coat, to seal the cake and prevent any crumbs from showing up on in the second layer of frosting. Chill for 30 minutes minimum, up to an hour. 6. Once chilled, apply another layer of frosting evenly around the cake, making sure to keep the top even and level as well. 7. With a piping bag fitted with a star tip, pipe 14 rosettes onto the top of the cake. 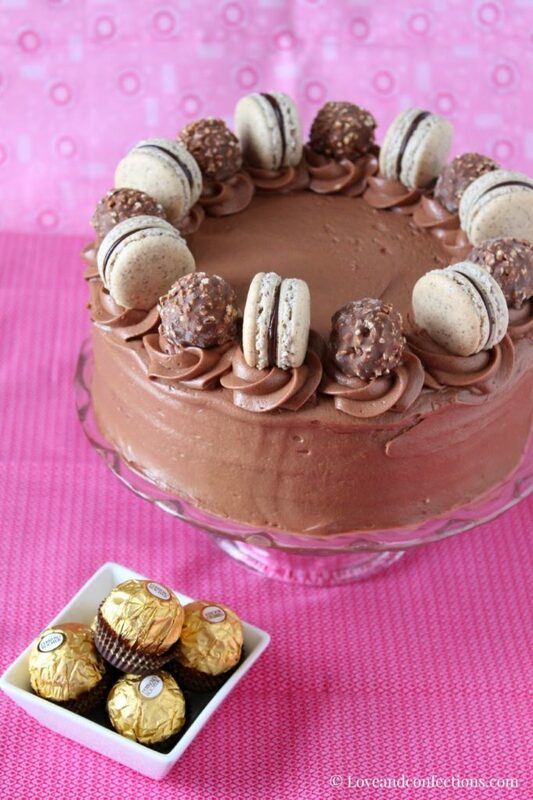 Alternate the Macarons and Ferrero Rochers. Refrigerate for at least 30 minutes. Keep refrigerated until serving at room temperature. 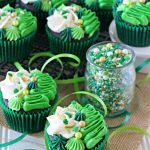 Join me and my other Food Blog Friends as we celebrate with dishes, drinks and desserts for my virtual Birthday Party! Disclaimer: I was not compensated to use or mention the brands above. I only use brands that I love. All opinions are my own. There are affiliate links in this post. Thank you so much, Liz for participating! Thanks, Marion! We had a blast in Savannah and can't wait to tell you about it. HAPPY BIRTHDAY!! You baked yourself the most amazing cake ever, wish I was there to celebrate with you and chow down! I wish you could have had a piece too… are we adding something similar to the list? Lol. Hope to see you soon! 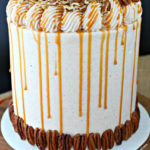 This cake looks phenomenal!!! Hope you have the happiest of birthdays!!! Happy birthday! We LOVE hazelnut. I might have to make this for the next celebration in the family. Thank you Camilla. It was SO good. Happy Happy Happy Birthday!!!!!! An amazing cake was needed for an amazing birthday. And you succeeded. Thank you Carol. It was a good birthday. This has got to be one of the most beautiful cakes I've ever seen! And the flavor must be seriously amazing with all that hazelnut. Absolutely in love with it, pinning for sure! Happy belated birthday! Thanks Allie. It was so good. I wish I had more of it for this week. Happy Belated Birthday to you too! 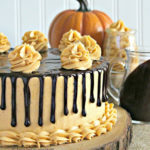 This cake is so awesomely hazelnutty delicious – you might just need to make it for yourself too. What a gorgeous and decadent cake. I want one and I also want to be thirty again! Happy birthday! Happy Birthday!! And what a gorgeous cake to celebrate with. I pink puffy heart Nutella! Thanks! I definitely pink puffy heart Nutella too! Terri: Happy Birthday!!!! This is the perfect cake to celebrate such an important date…It is so scrumptious and pretty! Terriiiiiiii!!!! Once again, happy birthday! 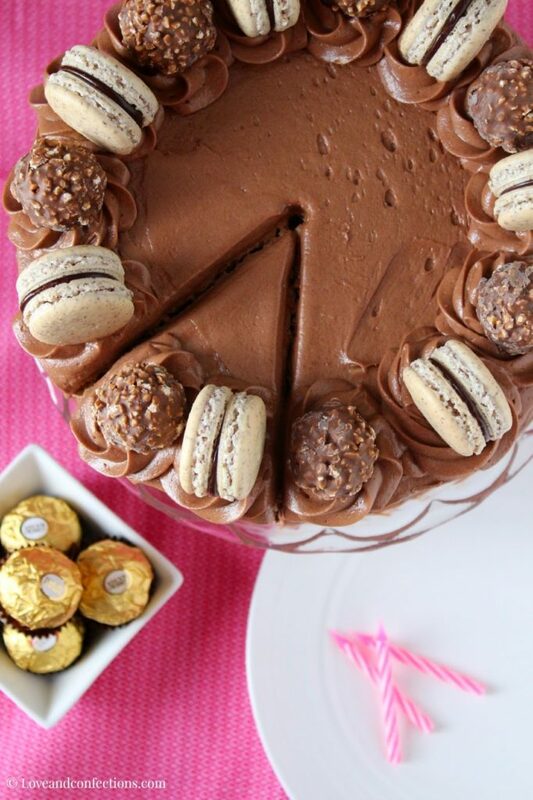 And girl, this cake would make any day happy because it's amazeballs. Everything about it is exquisite – those perfectly even, moist layers of cake, that creamy frosting, the adorable macarons with perfect little feet. I love everything about this! You definitely deserved to indulge on your special day. Thanks Nancy! It was so good! I love it when the macarons get perfect feet. This cake is the reason why I LOVE birthdays! 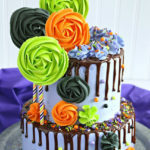 I am seriously wishing I was as talented as you to bake that amazing cake! 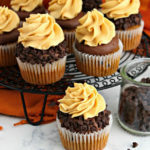 I will have to settle for drooling at the pictures until someone makes it and invites me over! Happy birthday! Cheers to you! I can definitely invite you over the next time I make a big cake like this. It is really easy to make, I'm sure you could do it too.